Just Create: What Are The Ideal Body Measurements? What Are The Ideal Body Measurements? 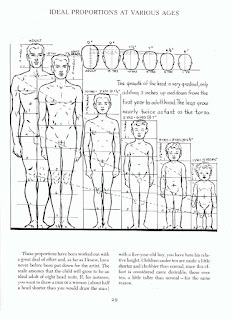 The below diagrams shows how different height measurements can be used for adults and children in drawing. The normal figure measures 7 1/2 heads in height. This looks kind of dumpy and why this measurement isn’t used much in comics. 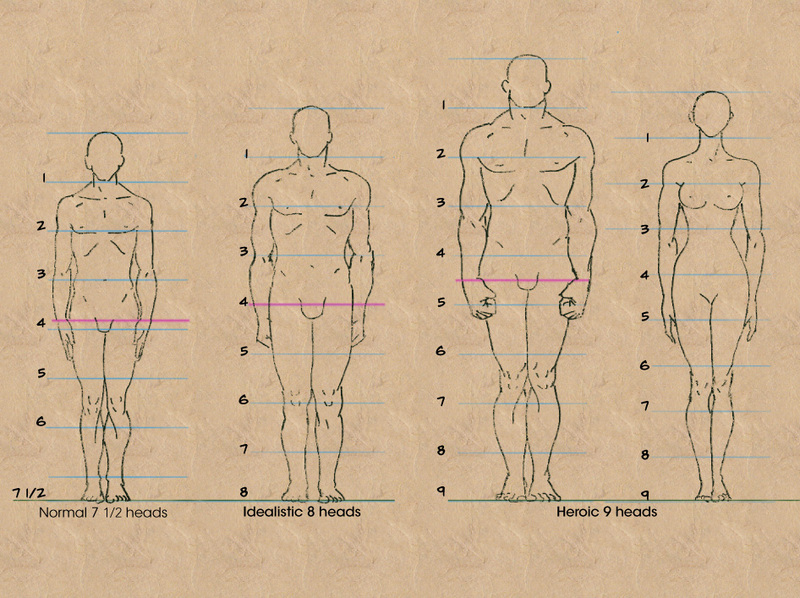 The ideal figure measures 8 heads in height. This was used in most Renaissance paintings. The heroic figure measures 9 heads in height. Most superheroes are drawn in this realm. 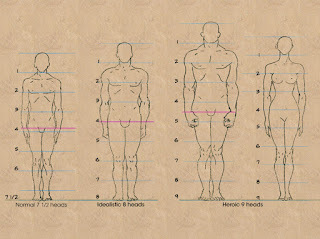 Men’s shoulders are wider than their hips. The crotch is located exactly at the halfway point on his body. His knees are located hallway between his crotch and the soles of his feet. Men’s muscles create more bumps and angles. With women shoulders and hips are about the same width. The crotch is located exactly at the halfway point on her body. However, there is some leeway to move it up or down to create long legs or a long waist. Women are to drawn with soft, flowing curvy lines. We will discuss drawing women in a lot more detail in the future. 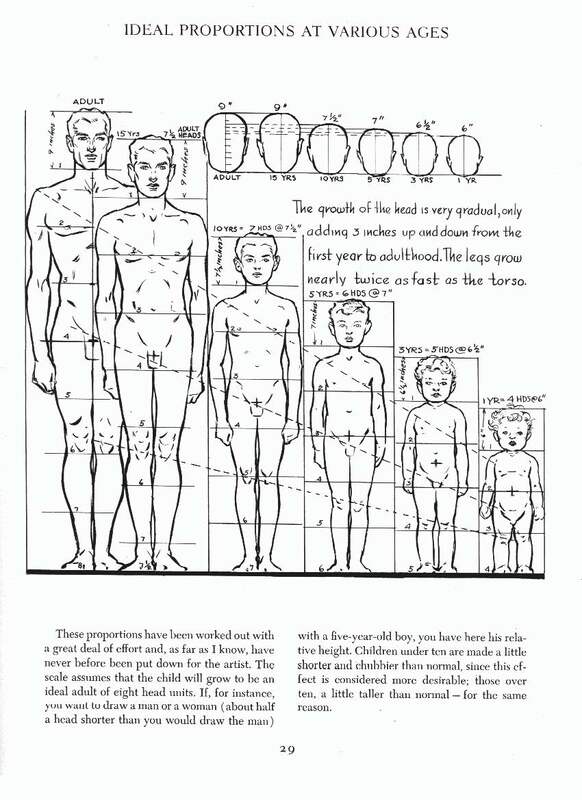 Realistic proportions for kids never look good in comics. So let’s skip that and get right to the idealistic measurements. Smooth fat layers cover their joints and may have dimples. Keep face features small in relation to head size. There a certain heights that people are accustomed to seeing in figures and make assumptions about them. These assumptions can be used to your advantage. To communicate about your character or to go against type to give your audience something unexpected. read next - Do Artists Use Reference? Follow and subscribe to me. If you have found this helpful, please let me know and share with other creators. Are the explanations clear and complete? Feel free to ask me questions. How Do I Keep From Looking Goofy? How Does Observing Anatomy Help Your Drawing?